The Institute for Fiscal Studies (IFS) said average incomes in 2014-15 are about the same as they were in 2007–08, before the banking crisis triggered a deep recession. 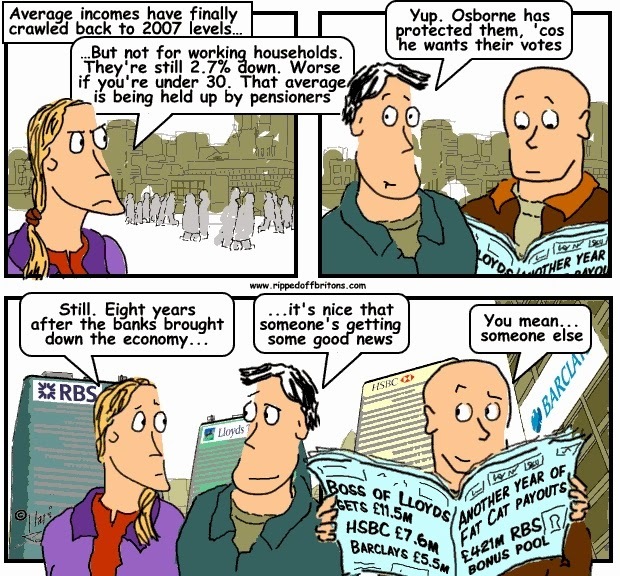 The average has been lifted because people over 60 are better off. Their average income is forecast to be 1.8% higher in 2014-15 than in 2007-08, but the average income of 22- to 30-year-olds is estimated to be 7.6% lower than before the financial crisis. While pensioners have been hit badly by the rising cost of energy and food in recent years, they have been helped by measures such as the “triple locking” of the state pension, which guarantees it is raised by a certain amount. Household spending power has risen owing to a big drop in inflation and a steady fall in unemployment, the thinktank said. But the recovery has been slower than after the previous three recessions because incomes have been squeezed by weak wage growth, tax increases and benefit cuts. Andrew Hood, an IFS research economist who co-wrote the report, said: “The young have done much worse than the old, those on higher incomes somewhat worse than those on lower incomes, and those with children better than those without.” The IFS said large falls in real earnings (adjusted for inflation) have had a bigger effect on wealthier households, while poorer households, which tend to spend a bigger share of its income on food and energy costs, have been hit harder by the rising cost of living. Accounting for average inflation only, since 2007–08 median income for working households has fallen by 3.5% in real terms, compared with a rise of 4.0% for nonworking households. This large cumulative difference is driven by changes up to 2012– 13, which have been partially unwound since then. Real median income for non-working households rose by 5.4% in the first two years of the recession, as the result of increases in the real value of benefits. In contrast, median income for this group is projected to have fallen by 3.0% from 2012–13 to 2014–15, as the coalition government’s benefit cuts accelerated. Meanwhile, median income for working households is simulated to have risen by 1.0% over the last two years, after a fall of 5.6% between 2009–10 and 2012–13 (driven by falling real earnings). However, the story changes significantly when we allow for differences in the inflation rates faced by the two groups. The fall in mortgage interest costs up to 2009–10 helped support the real incomes of working households, while high food and energy inflation had a particularly large impact on non-working households. This means that while median income for non-working households rose by 5.4% from 2007–08 to 2009–10 after accounting for average inflation, it rose by only 1.1% after allowing for the higher-than average inflation faced by these households. Looking at the period since the recession as a whole, and after accounting for group-specific inflation, the falls in median income for working households are only slightly larger than those for non-working households (2.7% and 1.9% respectively).